A couple weeks ago I talked about how I'm not quick to recommend collecting more stuff, but that there was a kitchen gadget I couldn't live without-the healthy dressings bottle. Well, as much as it goes against my grain, I have to share my enthusiasm about a couple more gadgets that I've found to be worth the space they take up. First, I'm talking about the Zak EZ ROL Garlic Peeler. The original, and still the best, garlic peeler on the market, the Zak! It is a thick silicone sleeve that cushions your hands, so it's comfortable to roll over lumpy garlic cloves inserted into it. It took just about five seconds to strip a clove, thoroughly removing peels from cloves of all sizes and shapes without bruising the garlic. It held and peeled up to five medium cloves at a time. 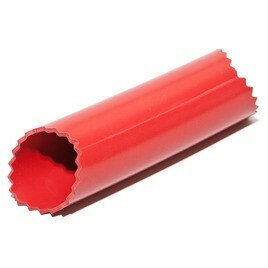 The simple, open-ended tube cleaned up easily and dried completely, whether washed by hand or in the dishwasher (top rack recommended). Sure, you can whack the garlic clove with the side of a knife blade when you need to peel it, but the testers at America's Test Kitchen found that after trying both methods, this garlic peeler was a much better option. The reason? The ZAK tube leaves the garlic cloves unbruised. This can't be said for knife whacking. The peeler uses a gentle process that tugs the papery skin off the cloves and leaves them intact. Thus, this tool is perfecto use when recipes call for whole or sliced cloves. If you're just chopping or mincing your garlic, then knife whacking is OK-so what if the clove is bruised. But I found that not only does the peeler not bruise the garlic, it's also quicker than doing the knife whack. "Quicker" is very often important to me. This gadget retails for around $8.79 and comes HIGHLY RECOMMENDED by America's Test Kitchen. I second their vote. Next up is the AMCO Rub-Away Bar. Rubbing this stainless steel bar of "soap" under cold water does a superb job of eliminating garlic odors from your hands. While any stainless steel surface does the same trick, the low price and comfortable shape make this tool worth having. I keep mine sitting on my sink top next to my bottle of handwash. 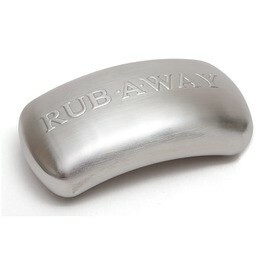 As the photo shows, the Rub-A-Way Bar is a block of stainless steel shaped like a bar of soap that promises to erase all garlic smell from your hands. It lived up to its promise-it worked like magic, with just a little cold tap water. Theories abound as to how it works-the most plausible being that the metal binds to garlic's odorous sulfur compounds, removing them from your skin. 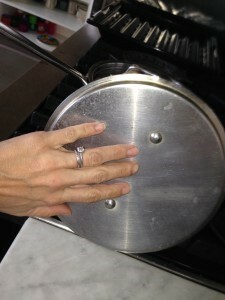 While you can get the same result from pulling a stainless steel bowl out of your cupboard and rubbing your hands on it, or rubbing your hands over a stainless steel pot or pan lid, or all around a stainless steel sink (if you have one) the soap bar shape is easier and more convenient to use (and to clean). It retails for around $6.99 and will never wear out, which is such a good thing, because I'm an avid fresh garlic user and will never quit this habit. So as I said above, if you are too, then these gadgets are SO worth the space they take up!